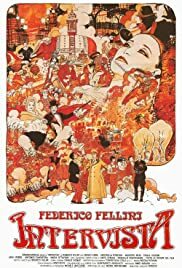 Federico Fellini: You here already? Go home to bed. I don't know what the reviewers were thinking, but with Ebert leading the pack, it might be safe to say that they weren't thinking at all. Intervista is an amazing film. It takes the shape of a fake documentary, in which Fellini looks at, and pokes fun at, his entire career. In the end it is an homage, not to himself, as other reviewers have suggested, but to film itself. Praise for a medium which never ceases to amaze viewers and film makers alike with it's capacity to project and create our dreams.